and found out we have less than a month to take care of all this business! talk about a whirlwind of news, excitement and craziness!! -my house looks like a tornado hit it. twice. decided to drive through what remained. ok, that's a slight exaggeration, however, it is a bit of a mess! over the years. and i am seriously struggling giving any of it up! (side note about me: i am a bit of a packrat/collector of clothing/shoes/accessories of any kind! i don't dare give anything up or away because i feel like it will either "come back" in style or that i will be able to make something else awesome out of it later. -let's just say this- 6th time moving in 3 years. yeah. i'm sick of it. crossing my fingers that this is the last time for a looooong time! i can not wait to be living in my new home! 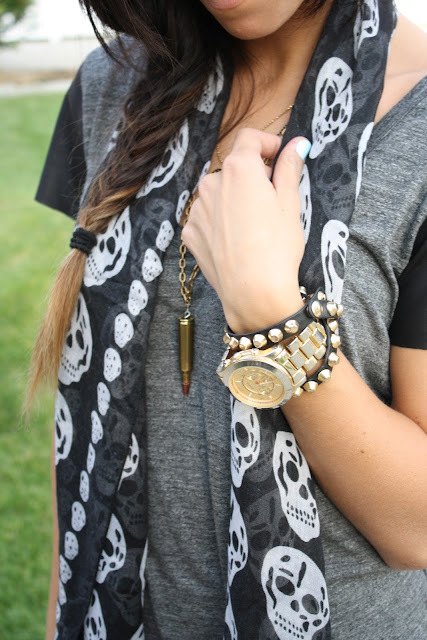 watch: windsor (similar), stud bracelet wrap: f21, bullet necklace: by yours truly! You are absolutely stunning and I love your outfit! loving that scarf - looks great paired with this whole outfit!! Good luck with the move! Looking forward to pics of the new digs. I can't tell you how much I love this outfit! I'm gonna try and channel you this weekend! Love it all, sister! At least you look cute while moving! And I can totally relate about having a hard time giving things up! I love this blog and you have great style! Keep up the good work, and I hope things get a little less chaotic soon. I was so happy when we bought our house a couple of years ago because I knew it meant I won't be moving for a long time!